"Paleo-friendly chili to be served over cilantro-lime cauliflower rice." Heat olive oil in a heavy-bottomed saucepan with a lid over medium-high heat. Saute onion in hot oil until fragrant, about 3 minutes. Stir garlic and sofrito into the onion; saute until the garlic is fragrant, about 3 minutes more. Push the mixture to the side of the saucepan. Break turkey into pieces and add to the saucepan in the space free of the onion mixture; cook, stirring frequently, until browned and crumbly, 5 to 7 minutes. Stir tomatoes, water, and about 3/4 of the tomato paste into the turkey mixture until even in color; add cashews, chili powder, cumin, and cocoa powder. Stir mixture to incorporate seasoning, place the lid on the saucepan, reduce heat to medium-low, and cook at a simmer, stirring frequently and adding water to thin as desired, until the tomatoes are breaking down, about 1 hour. Season with salt and pepper. 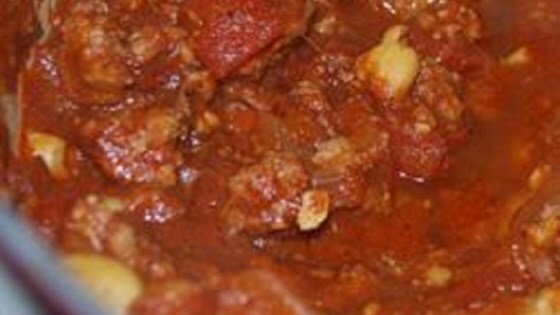 See how to mix up a big ol’ pot of chili—in just 99 seconds! Sofrito is available in a jar, though not paleo. Make your own with peppers, tomatoes, garlic, and cilantro. This was yummy! Cashews were a good substitute for beans!